Not long ago in Sydney’s Sunday school class, the teacher asked the kids what their parents did that embarrassed them. Of course, having heard about this question in our family’s post-church conversation, I wanted to know her answer. I was thinking about how her dad answers the phone in Japanese or teases her friends relentlessly when they come over. “Well, mom, um….I sort of said that you dance in the grocery store,” she said. Of course I dance in the grocery store, I said. Who can resist? Every week they play the Beach Boys and James Brown and the Rolling Stones. It’s happy music and I have a good time getting my groove on in the cereal aisle. What’s wrong with that? I wanted to know. “Oh mom,” she sighed, rolling her eyes. So you can see why she might not have chosen to go shopping with me in my pursuit of rain boots: there was the possibility of more dancing. I have more shoes right now than I have ever had in my life. In fact, for much of the last 15 years I have had only two pairs: Birkenstocks for summer and Doc Martins for winter. I added running shoes a few years ago when I started going to the gym. Then (when people in my congregation expressed their concern for my lack of attractive footwear—the only fashion they can see with my preaching robes on) I bought a practical pair of flats. And someone gave me a pair of low-heeled black shoes that they didn’t wear but happened to fit me perfectly. I realize that I may soon need a shoe rack. The thought fills me with horror. The reason I have never had many pairs of shoes is simple. As much as I like to groove in the grocery store, I hate shopping. And my reasoning is that if you buy just a few practical, good quality pairs of shoes you will have to shop less frequently. 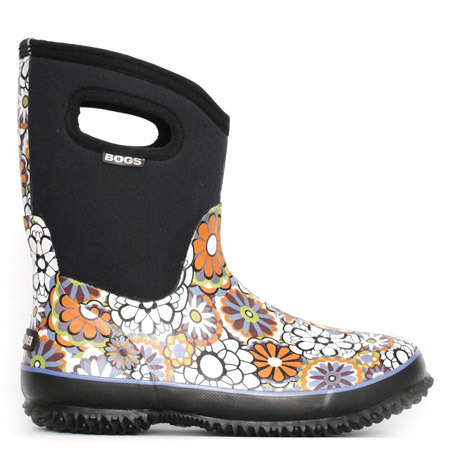 As a result, when I needed rain boots for my sabbatical so that I could be outside in the garden even in wet weather, I did some research online. I asked around, as did my husband, and everywhere the verdict was Bogs. These were going to be the best quality boots, the most versatile, and definitely the coolest looking. I had to go to Burlington to get them, and I had to be prepared for a hefty price tag. But since I will never buy another pair of boots (this is what I tell myself anyway) it would all be worth it. Not surprisingly, Sydney rolled her eyes. Today, on Day 2 at the convent, I was blessed with rain and the perfect opportunity to take my new boots for a test drive. I went for a long walk in the morning, enjoying the yellow daffodils and blue scilla and forsythia bushes that were almost glowing with colour. There were puddles galore and my feet were dry and I was happy. This entry was posted in Uncategorized and tagged boots, sabbatical. Bookmark the permalink. 🙂 This post made me smile. I like it a lot.